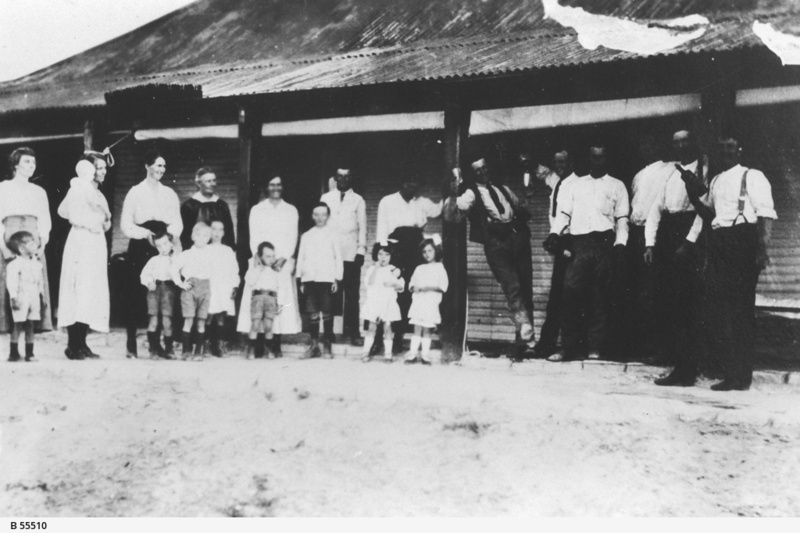 INNAMINCKA: A group of people on Innamincka Station. [2nd man from the right is Jim Kelly, 4th women from left is Ellen Edwards, 5th women from the left is Doll Kelly. 1st man from left is Walter Edwards, the 6th woman from the left is Rene Rowlands. In front of her are twins called Olly & Nellie. The others are Kelly children including Ellen, Cyril and Ern.] According to a researcher, Rene Rowland is Irene Rowland (nee Pope). Her father was Albert Pope who was the Licensee of the Innamincka Hotel from 1900-1913. Her mother was Harriet Lilly (nee Thomas). Irene married Arkell Harcourt Rowland in 1915. Arkell (known as Artie) later became the Manager of Innamincka Station and was known as one of the best stockmen of the North. Their twins Alice May and Ellen Ada were born in 1916 so this picture would have been taken perhaps about 1919.